Discovering where your ancestors came from is one of the more popular reasons to do a DNA test but the current ancestry composition algorithms have a long way to go. Sometimes East Asian ancestry is actually American Indian and South Asian might be gypsy or Indian Indian. Scandinavian might be British or North German and British and Irish might be Scandinavian. Most efforts to analyze the deeper roots of your ancestry are based on samples of modern populations who self report four grandparents of a single ethnicity plus some public databases and a few ancient samples. Since each company relies greatly on their own databases of tested people, it is not surprising to see differences in their predictions. Since my brother is tested at all three companies I thought I would post the images of what each company sees in his DNA as well show the new report from DNA.land and a few from GEDmatch (both using his uploaded Ancestry.com DNA data). We are confident of our recent ancestry: 50% Southern Norwegian, 25% Bavarian German and 25% Ashkenazi. 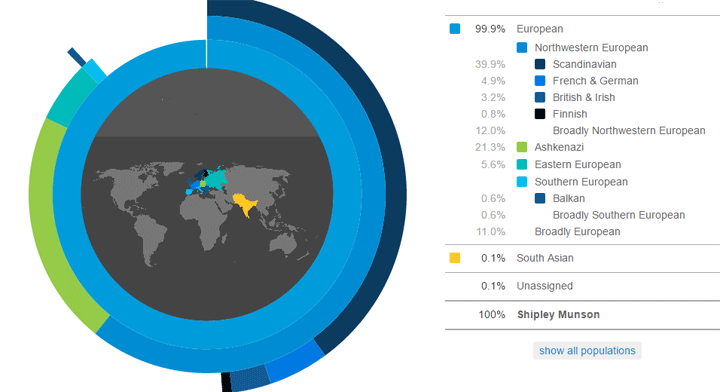 The new DNA.land report is shown above, Hmmm, only 16% Ashkenazi. Perhaps you are wondering who the Tubalar are? According to Wikipedia, they are “an ethnic group native to the Altai Republic in Russia.” It also helps to know some European history to interpret the rest. Parts of Northern Italy were at various times included in the duchy of Bavaria not to mention that all of southern Bavaria south of the Danube once was part of the Roman empire. I suspect that SouthWest Europe is part of our Ashkenazi heritage, at least the ancient Sephardic part. Here the Norwegian shows as Scandinavian, British and Irish (our viking ancestors had relatives who settled there), and Finnish. Also the French and German. These results are actually phased with our Norwegian Dad so this is known. Notice that this is a “split view” with Dad’s contribution on the right. 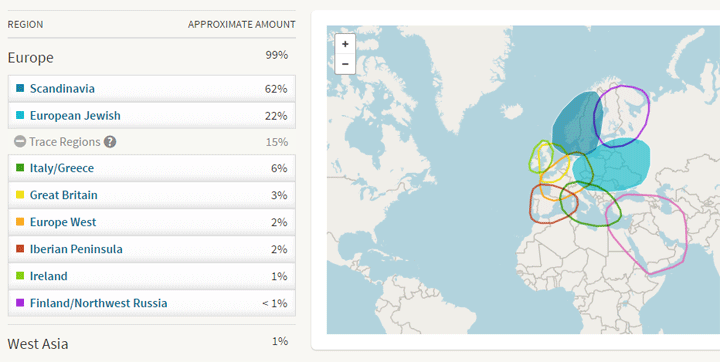 23andme shows a higher percentage of Ashkenazi, 21.3% which seems a better fit with what we know. Remember you do not necessarily get exactly 25% from each grandparent, it can easily be a few percent more or less. For comparison my Ashkenazi at 23andme is predicted at 28% from the same grandparent. Finally the Bavarian must be the Southern and Eastern European as well as the various broadly Europeans. Well it seems to agree with 23andme on the percentage of Ashkenazi but some of that 62% Scandinavian has to be Bavarian. Did the Vikings get that far South? And most of those trace populations are probably the Bavarians except the Irish piece, we know the Vikings went there too. How about Family Tree DNA? This chart is closer to DNA.land in the Ashkenazi estimate of only 16% but add the central Asia and Southern Europe to that and you get close to 20%. The British prediction has to be our Norwegians (yes the Vikings settled there too) add that to the Scandinavian and we are almost at the expected 50% Norwegian. So the Bavarians are Western and Central Europe. This all makes sense. So what have we learned from this exercise? To look at deeper history when unraveling these predictions. One company’s British might be another company’s Scandinavian. Also to recognize that these predictions reach further into the past than our family tree does and may reflect earlier migrations around Europe. Finally, predicting deeper ancestry is not yet firm science or these companies would be closer to each other in their results. Here the North Sea and South Baltic would be the Norwegian plus most likely that Volga-Ural (the Tubalar again?) but where does the Ashkenazi fit in, Mediterranean plus SW Asia? Well it has less Ashkenazi than any of the others but if you add in the Eastern Mediterranean, the Western Asian, and the Middle Eastern it gets up to about 20%. Ancestry DNA has a white paper describing its ancestry composition algothim here. “the Ashkenazi mainly descend from a few hundred founders, but carry Central European, Eastern European, Middle Eastern, African and probably many other admixtures, as evidenced by their genome-wide and uniparental markers. UPDATE 4/17: Mind you the above post is three years old and both 23andme and ancestry have large enough databases these days that they seem to be able to predict the Ashkenazi composition fairly accurately. Both Israel Pickholtz at http://allmyforeparents.blogspot.com/2016/04/julians-father-using-ethnicity.html and I in my first post on the X have used the Ashkenazi predictions to look at more recent genealogical questions. Hopefully the images of my brother’s ancestry were a helpful way to see the differences in ancestry predictions between the companies. Well said! The way I look at the various results is simple. I’ve done AncestryDNA, FTDNA, and transfered to DNALand and GEDMatch. I look at the various reports and make a mental “average” of all the reports. There is general agreement with my top three groups with my known family history. The conclusion I draw? I am an American North Western European mutt with a touch of Iberian/Western Med. Were it not for the Iberian or Sardinian (DNALand) I’d be really, really “white bread.” I’ll leave it at that. Worrying about it would be a waste of time. Like trainspotting. Victor – the last example above is from Jtest, it calls some of my brother’s jewish DNA western med and some western asian … it shows way too little AJ since we know our grandad was a german jew. You need to use the spreadsheets to properly interpret the Eurogenes results – for example the JTest Ashkenazi sample average for a full Ashkenazi Jew cores 28.90 on Ashkenazi – this would imply for you that a score of 9 makes gives you between 25-30% jewish ancestry, which is exactly what you would expect. I also got Tubalar NE Asian 2.7%. I wonder what that means. I have a few things to note. I was surprised to find out I am part Native American, the various testing companies did not pick this up I found it on paper being a descendant of Matoaka(Pocahontas). 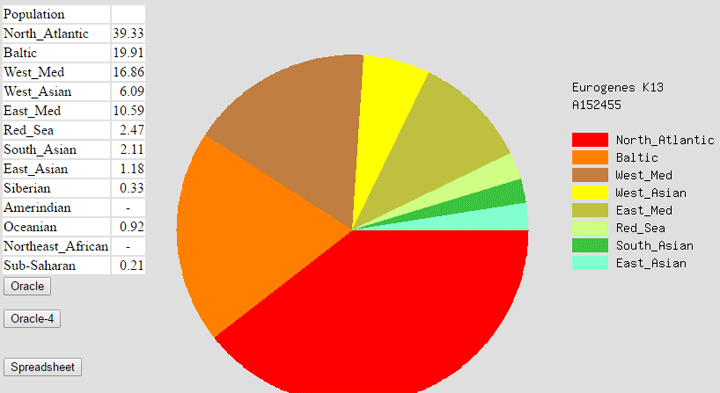 I decided to try GEDmatch and low and behold it does pick up Native America, although below 1%. Another thing I have been playing with is Ancestry raw DNA files. I have one from the version 1 chip and version 2. I have been uploading both files elsewhere and have been noticing a difference in number of matches as well as major differences between the 2 when it came to ethnicity. It turns out that the newer tests being done under the version 2 chip, Ancestry is throwing out hundreds of thousands of SNPs which are affecting results majorly when transferring outside of Ancestry. The guy who made the Jtest said it’s just for fun tool and not too accurate. 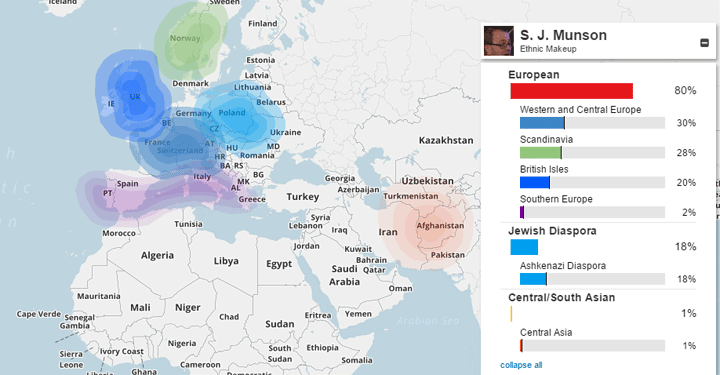 FTDNA shows 21% sephardic. Ancestry on the other hand show 2% Ashkenazi do you at both or do you just move on.